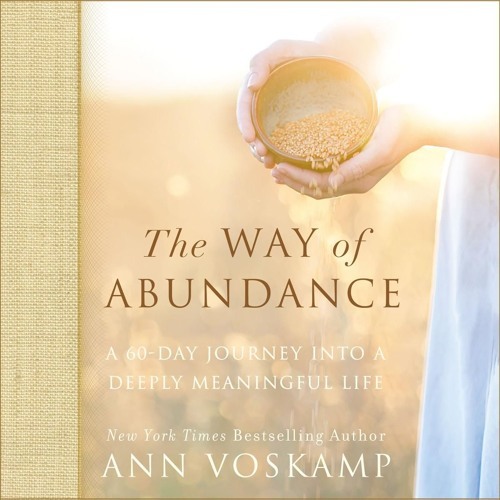 Order Audiobook - http://amzn.to/2FJVE9L Narrated by the author, Ann Voskamp. What do you do when you wake up and feel like you're not enough for your life? Or when you look out the kitchen window as dusk falls and wonder how do you live when life keeps breaking your heart? As Ann Voskamp writes, "great grief isn't meant to fit inside your body. It's why your heart breaks." And each of us holds enough brokenness to overflow - to be given as the greatest story of our lives. In 60 vulnerably soulful stories, The Way of Abundance moves from self-weary brokenness to Christ-focused givenness. Drawing from the critically acclaimed New York Times best seller The Broken Way and Ann's online essays, this devotional dares us to embrace brokenness as a gift that moves us to givenness as a way to draw closer to the heart of God. Christ himself broke like bread, giving himself to us so we might have a lifelong communion with him. Could it be that our brokenness is also a gift to the world? This gentle but exquisitely profound book does nothing less than take you on an intimate journey of the soul. As Ann writes, "The wound in his side proves that Jesus is always on the side of the suffering, the wounded, the busted, the broken." Discover how surrendering in unexpected ways is the first step toward receiving what you long for. Discover the good news that your beauty is not in your strength but in your fragility. Discover why your healing shines radiant through your wounds - and how only in brokenness will you ever be whole - and find the way to the abundance you were meant for.